Promising new drugs to treat lung cancer are being trialled and their effectiveness monitored using multiple imaging methods at Monash Biomedical Imaging (MBI). 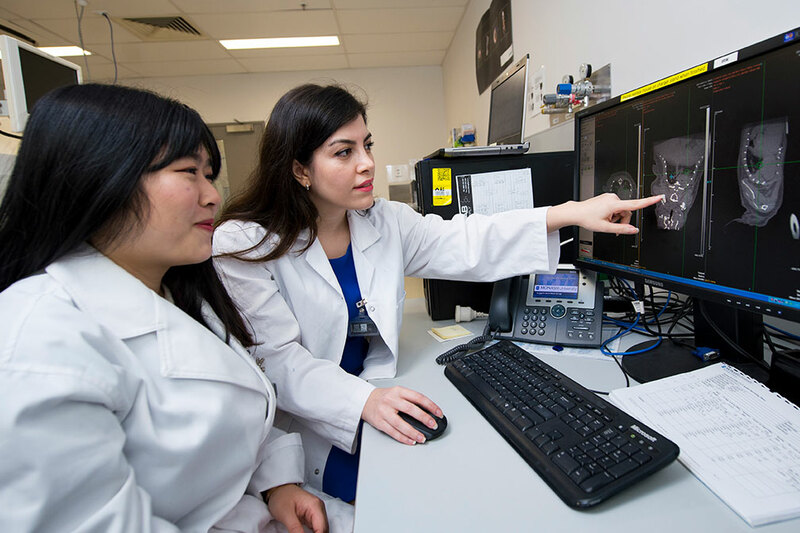 Two PhD students, Jasmine Chen and Aleks Guanizo, from Daniel Gough’s research group at the Hudson Research Institute, are using MBI’s Inveon PET-SPECT-CT small animal scanner to measure lung tumour progression in live mice. research CT images with MBI's Tara Sepehrizadeh (R). The mice develop small cell lung cancer following the induction of a mix of cancer-causing genetic changes observed in human patients with the same form of cancer. Using MBI’s Inveon CT, the researchers are able to monitor how quickly the tumours develop and grow. Cohorts of mice are treated with either chemotherapy drugs currently used in patients or with novel targeted drugs that could benefit patients if they progress to human trials. Lungs can be difficult to image as they move with each breath so the researchers have only a brief moment to capture an image. The images are all collected during a single period in the breathing cycle. Once collated, a 3D image is generated of the mouse lung and any tumour mass that might exist. Tumour volumes can then be calculated using rendered 3D images. Oncologists are increasingly using PET-CT to monitor tumour progression in their patients. With MBI’s Inveon PET-CT, Aleks is now following a similar method to measure glucose uptake and track how the mouse lung tumours are spreading. 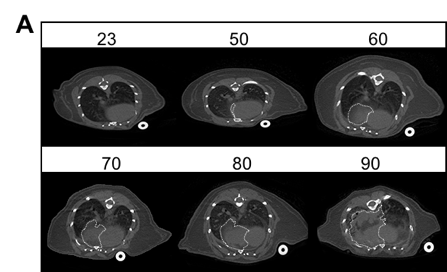 Using MBI’s Inveon PET-SPECT-CT, these images show how lung tumours in mice can be monitored over time (23-90 days). The tumour mass is highlighted by the white dashed line. 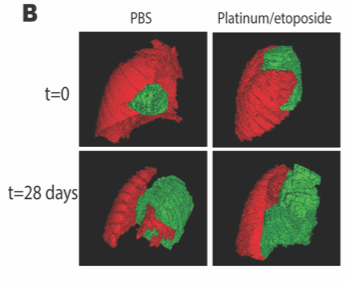 3D reconstructions of lung (red) and tumour (green) in mice treated with vehicle (PBS) or with standard of care chemotherapy (Platinum/etoposide).